Here we have books, in alphabetical order by author, with some short review and commentary, and reasons why you might like or dislike the book. Anderson, M. T. Feed. Cambridge, MA: Candlewick, 2002. Print. In a future world where internet connections feed directly into the brains of 73% of Americans, where thought is supplemented by advertising banners, consumer identity is character and language has descended into ruin, a little love story unfolds. Titus, an average kid on a weekend trip to the moon, meets Violet, a brainy girl who has decided to resist the feed. Assaulted by a hacker who interrupts their feed connection, the two struggle to first cope without the feed and then to understand what has happened to them – and eventually to understand the implications of all things being connected. In his National Book Award finalist Feed, M. T. Anderson has created a savage technology-dependant dystopia that captivates readers with its bleak imagined future which implicates apathetic teenagers in, not only the natural world’s destruction but the destruction of ‘human’. Anderson writes in a sporadic mix of ‘feednet’ messages, m-chat messages between characters and Titus’ first person narration, giving the reader a good sense of how chaotic and limited an average citizen’s own thought and attention span have become. Feed critiques the self-centredness that consumerism has created in western society and speculates about the catastrophic end that continuing to depend solely on oneself and a connection to technology might lead to. I have this desire to compare Shakespeare’s Titus Andronicus with Anderson’s Feed but, I’ll leave that for now – I’m sure we’ll have a Shakespeare month. The feed feeds on the structure of the nation, a stratified and uninformed mass connected only to the ‘net’ and no longer to each other. It feeds on the environment which is suffering immensely under the strain of consumption and lack of sustainable practices. Most horrific of all, it is literally feeding on the bodies of the people. The citizens, whose bodies are naturally resisting the implantation of technology into their biology, are literally falling apart. The authority of feed technology is absolute, and the message of Feed is to fight it now before it’s too late. Why you might like: It is a true dystopia. It resembles Orwell’s 1984 in many ways – male protagonist walks through life until he meets a girl who questions the system and mutual destruction ensues. It’s a very interesting, very quick read. It’s brilliant. Card, Orson Scott. Ender’s Game. New York: Tor, 1991. Print. 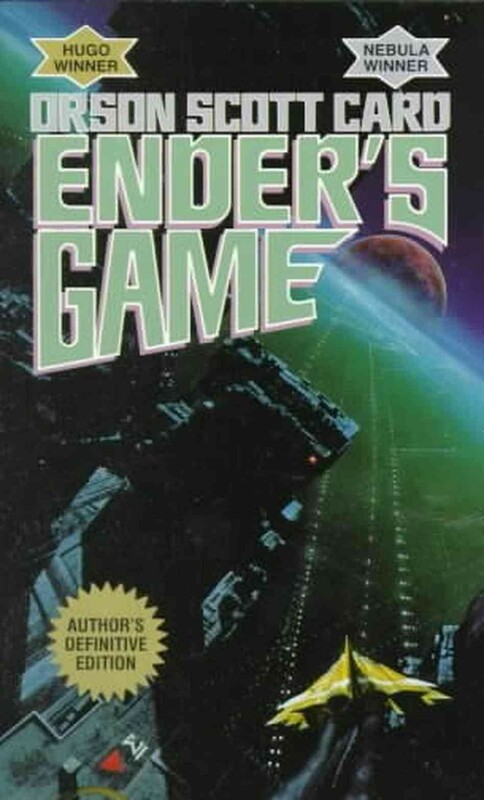 I know I’ve already posted on Ender’s Game this month, so I’ll keep the review short. In order to develop a secure defense against a hostile alien race’s next attack, government agencies breed child geniuses and train them as soldiers. Ender Wiggin of Ender’s Game, a prodigy among geniuses, is recruited for command of Earth’s armies. Though he doesn’t know it, the ‘game’ that he plays is actually the war between humans and the alien species, the Buggers. Multiple narrators share the text and Card carefully builds empathetic and clever characters; though it is the care with which Card has created Ender as ever thoughtful, reflective, dispassionate, and aware of his setting it is the story that makes this book so compelling. The meta-textual level builds depth of character and a belief in the ‘genius’ of Ender. Winner of the Margaret A. Edwards award for lifetime contribution to young adult literature, Card’s novel pits children as the saviours of Earth against adults as the ones who harness the child’s strength and intellect to eradicate the fears of humanity. It is Earth, inhabited by adults, and not Battle School, that is the dystopia. It is on Earth that child geniuses are created and sent into battle; it is Earth and its civilization that began the wars with the Buggers without parlay, without even attempting to reach a peaceful agreement. So while Ender will always miss the beauty of Earth’s natural environment, he has no desire to return to a place so corrupted by humanity. Why you might like: It’s a classic. It is very interesting and the battle sequences and the training, in the book, are awesome. The interiority of the book just cannot be captured on the big screen, so I recommend reading this and then watching the film as a visual companion to the book. Why you might not like it: Card himself might be your reason – though I urge you to look past that, authorial intent is interesting to consider, but only if you’ve read the book. It is a little old school – but it’s very hard to tell. It is heavy on the philosophy at times, which is not for everyone. Golding, William. Lord of the Flies, William Golding. New York: Putnam, 1954. Print. This is an oldy that many were required to read in high school, where we all detested it because it was a common cause. I would encourage you to try it again because it is bloody, brutal and fascinating. 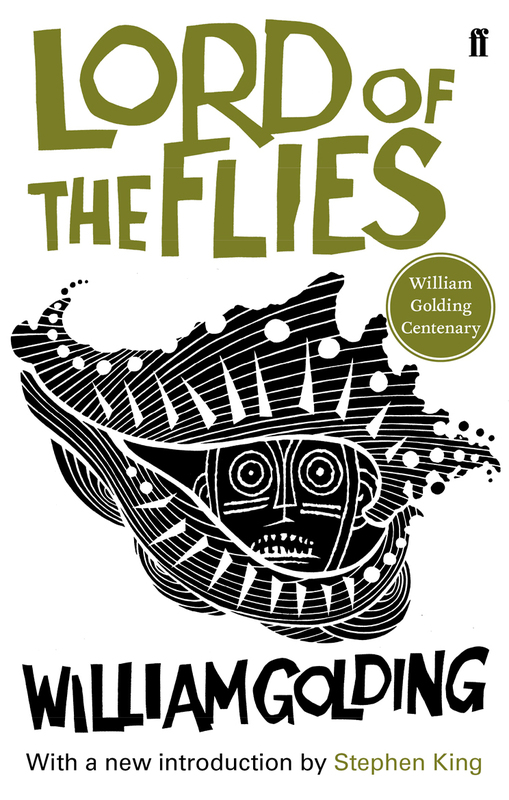 When a class of boys is stranded after a plane crash, humanity’s dark side arises and chaos, brutality and tyranny is showcased in Lord of the Flies, William Golding’s 1954 social commentary. Golding’s canonical dystopia pits children against themselves and against the natural world. The setting of Golding’s story is a beautiful lush island, a natural utopia, which is quickly turned into a frightening dystopia as the boys attempt to recreate the civilization that they know. The boys’ attempts at electing a leader and organizing themselves quickly fails and they begin to split into a survivalist hierarchy. It doesn’t take long for a ‘big brother’ type sense of surveillance to arise in the form of ‘the beast’ (either the pig’s head or the actual lord of the flies). Nor is it difficult for the tyrannical leader, Jack, to lure the boys from civility and reason into savage survivalist chaos kept in check only by the night, by fear of their natural surroundings, and by Jack who controls the fire. Nature in The Lord of the Flies is painted as an ambiguous and dangerous force that provides sustenance but that is also a threat to ‘civilization’ and life. By corrupting the children who try to model the society that they know, Golding is condemning society, the hierarchies and systems that exist. He is perhaps suggesting that humanity is so far removed from our nature and from knowledge of the natural environment, that when we are put back into it we become savages clinging futilely to an unnatural constructed way of living. Why you might not like it: High school ruined it for you. Your friends are telling you it’s the worst book since the industrial revolution. It’s a classic and therefore old and ‘not your style’ (she said mockingly). Can you tell that this is one of my favourite books of all time. Of ALL time! I have posted on it this month already, so this’ll be quick. Jonas’ world was perfect, until he was chosen to be the ‘receiver of memory’. He quickly comes to realize that his perfect society, in which there is no pain but complete cooperation, is really a dystopia, as any who do not fit the community’s standard of perfection are “released” or put to death. Lois Lowry’s Newberry Award winning book has become part of the pedagogical canon and speculates at a future without choice. The elegance with which the world of the community is slowly constructed and then deconstructed is captivating and seamless.. The bionetwork of The Giver is fascinating: in order to keep crops growing all year, the weather must be controlled; there is an ominous lack of wildlife, probably in order to keep them away from crops or because controlling the weather has killed them off; the land has been flattened so that shipments can be more fuel efficient. The result of these actions is a world void of colour and sound with a lack of variation. There is biotechnology too, as it is implied that the people of the community are bio-engineered to eradicate difference, and all sexual urges are repressed by a pill taken daily. Nature in The Giver becomes a metaphor for experience. Controlling nature, both human and environmental, has eradicated all that is beautiful and horrible about life. Jonas boldly decides that the community cannot live without choice and strikes off into the wild. The ending is a cliff-hanger, and it leaves readers wondering if there is indeed hope for Jonas’ survival in nature, and if there is hope for a society that will be subject to the memories of a varietal life – and of course what about the Giver? Why you might like it: Hello!? Steph’s favourite book. Read it. Why you might not like it: … I got nothing… It was ruined for you in school? The places is Los Angeles, the Republic of America; the year 2130. Following societal and economic cataclysm, the western territories of the former United States of America have seceded and formed the new Republic, while other states to the unite as the Confederation. Tensions are high between these two factions, but it is within the Republic that a war is brewing. In order to separate the cream of the crop from… well… the rest of the crop, the Republic (in a very Giver –esque way) requires all of its children to be subject to the Trials when they turn 10 years old. A high Trial score means a life of privilege and service directly to the Republic, low means menial labour, customer service, garbage pick-up – but a failing grade means medical experimentation and death a life sentenced to labor camps, never to be seen by family or friends again. Our protagonist, Day, failed, endured experimentation and then escaped. He is an independent anarchist, striking out at the Republic in any way he can, bombing their buildings and the like, he is infamous, the number one enemy of the state – until the plague hits again and he tries to steal plague medicine… And then there is June on the flipside. Perfect score in the trials, perfect in every way for a life of service to the Republic, until she encounters Day. The story is told in a back and forth, one chapter in yellow text is Day followed by a chapter in blue text for June. It feels an awful lot like Deathnote if any of you have read or watched that. Legend is full of intrigue, an adrenaline-fueled, action-packed, fun novel. It is easy to read, probably because there isn’t anything too new going on: at center stage, we’ve got the brilliant super genius protagonists, who of course are super hot, who of course fall for each other despite their fifteeen-years of accumulated baggage. However, the writing is beautiful and easy to read, the love isn’t sappy and manipulative, it is more like a mutual respect – and there really isn’t that much time because the pacing is so fast. While the plot itself and the mechanics behind it are fairly transparent I enjoyed this dystopia for its characters, for it’s obvious nods to it’s ancestors and because the female protagonist and the male protagonist have dimension, they are equal, smart, witty, proactive and fairly realistic in many ways. Perhaps the major critique I have are the unshakable noble values that each of our young protagonists seem to hold in their hearts – which is so starkly juxtaposed with the villains of the piece – the adult monsters. Why you might like it: It’s better than Divergent in my mind. The characters are gripping, the writing is elegant and the story, though not anything incredibly inventive still feels fresh. It may not truly be a dystopia – that is perhaps left in the Dust with the dual storytelling (and therefore the revelation that it is a dystopia…really early on and exactly why it is one ugh) but! It’s worth a read with a bag of popcorn. Why you might not like it: It’s been labelled dystopia and it’s more of an action-romance. Depending which one you like you might feel blind-sided a little. Dual POV. Weird text colours. Blatantly moral characters pitted against machinations of pure evil might be getting old. Macaulay, David. Baaa. Boston: Houghton Mifflin, 1985. Print. A dystopian starring sheep, Baaa is a chilling cautionary tale about passivity and consumption – literally. There is no record of the last human, but everything that humans created lies empty upon the earth, ready for the sheep to overtake it. The story follows sheep through the evolution of human civilization, as the sheep run out of field they head to the city and begin eating gardens, then human foodstuffs, at which point the television turns on, language is acquired and civilization, as we know it, speeds up. Borrowing ideas from George Orwell’s 1984 and its treatment of language as power, the sheep, enthralled by television and the idea of humanity and begin to inhabit the homes of people, they learn to operate technology, the create laws, establishments and conventions (several nuclear families are depicted). Baaa takes a turn for the gruesome and the morally precarious as the sheep run out of food Times are prosperous and the population increases unchecked, which quickly leads to famine, war and then the invention of Baaa, a food stuff that is mass produced, which everyone loves and which solves all problems. The art in Baaa is black and white and beautifully done, a clear style with hidden pieces of story scattered throughout (an ear tag on a sheep at the beginning, hints that Baaa is made of sheep). Macaulay uses light and shade perfectly and creates texture and depth with cross hatching and carefully spaced lines. A quick, grim, fascinating, humorous and clever read which literally illustrates the impact that humans have had on themselves, their environment and shows the brutality and gruesome nature of industry. Why you might like it: It’s about 60 pages of pictures and words and it is truly gruesome and horrific and…just mesmerizing. Try it out. It’s fabulous. Why you might not like it: It’s kind of gross. Nelson, O. T. The Girl Who Owned a City. New York: Dell Pub., 1977. Print. Another old classic. O.T. Nelson’s popular dystopian story is one of the first ‘plague-ravaged earth’ stories for young adults. The only survivors of the plague are children aged 12 and under. As the remnants of a technological civilization dwindle, nature becomes the only resource children have for defending, sheltering and feeding themselves and they are forced to come to terms with having no control over the forces of nature. Gangs and fierce armies of children begin to form which raid anyone of everything. Lisa Nelson uses common sense and street smarts to, first keep herself and her younger brother alive, and then to rally all the kids on Grand Avenue into one large group that will reside in the school and call itself a city. The difference between Lisa’s group and the antagonist gang led by Tom Logan is that hers begins with the intention of being egalitarian, allowing for choice, allowing kids to come and go as they please. However, as Lisa begins to learn how to lead and create a civilization from the scraps of what adults left behind, she finds more and more that life is simply unfair and that she must take charge and responsibility over morally ambiguous acts. O.T. Nelson gives the reader a strong relatable female character coming to terms with not only the hard decisions of a leader, but with the perspective of an adult, parent, teacher, and role model that often puts her at odds with her child citizens. The ‘city’ space becomes a metaphor for growing up, of being responsible, making unfair decisions and of war, while nature becomes an easy choice, an escape and a space of freedom for Lisa. While the main conflict wraps up with a morally ambiguous resolution, it remains a powerful commentary on power, change and the resilience of children. Why you might like it: It is the original! Graham’s Gone series is a total rip-off, and not nearly as poetic or creative. Lisa is truly enigmatic, and her interiority, the dilemmas she has to face with leadership – the hard choices…It’s just wonderful. Why you might not like it: The bad guys are kids – and sometimes Lisa herself. The morality of the book is all in the grey and that might get under your skin. But don’t you want to read it to find out? Ness, Patrick. The Knife of Never Letting Go. Cambridge, MA: Candlewick, 2008. Print. Todd finds a patch of silence. Raised in Prentisstown, a town settled by space colonists, a town that was supposed to be Earth’s redeeming feature, where there are no women, and all the men are afflicted with a disease that allows every male creature hear ever other male creature’s thoughts, Todd and his dog Manchee are stunned. To live without the Noise is all Todd wishes for, it is a curse over the entire town; but when he discovers the source of the silence is a girl named Viola. Todd, Viola, and Manchee are chased into a race for the ever-elusive truth and a fight to survive. Readers and Todd are in the dark for much of the book, as he discovers the insidious secrets of Prentisstown and humanity; questions upon questions pile up as the action and risk heighten. The Knife of Never Letting Go is a true dystopian, humans forced to flee Earth find themselves embroiled in internal politics and corruptions, and on an alien inhabited planet with its own secret. The cascades of Noise that Todd hears is reflected in the typography: fonts of all shapes and sizes are used to depict the thoughts of different men. The language is phonetic and broken, and in many ways, because everyone can hear everyone else, the story is raw. Phonetic spellings and LOUD typography are spread randomly throughout the pages; this visual play creates the dystopian ambiance and brings it to the reader’s experience. This literal depiction of the stream of consciousness is paired with page-turning action and endearing, flawed and realistic characters. There is so much more to say, this is a fascinating, fast-paced, heart wrenching read and poor Todd is subject to so much awfulness. Why you might like it: The Noise is fascinating and so wonderfully illustrated. Todd and Manchee and Violet are wonderfully dynamic characters and we set off on a fast-paced adventure in what could have been a utopia. Why you might not like it: There are extremists, there is a lot of violence and some horrible, truly traumatic stuff happens to our beloved characters. It’s brutal, it’s a lot to take in. Pfeffer, Susan Beth. Life as We Knew It. Orlando: Harcourt, 2006. Print. We’ve had an interview with Susan Beth Pfeffer this month! Check that out! Now, on with the review. Miranda’s disbelief turns to fear when a meteor knocks the moon closer to the earth. 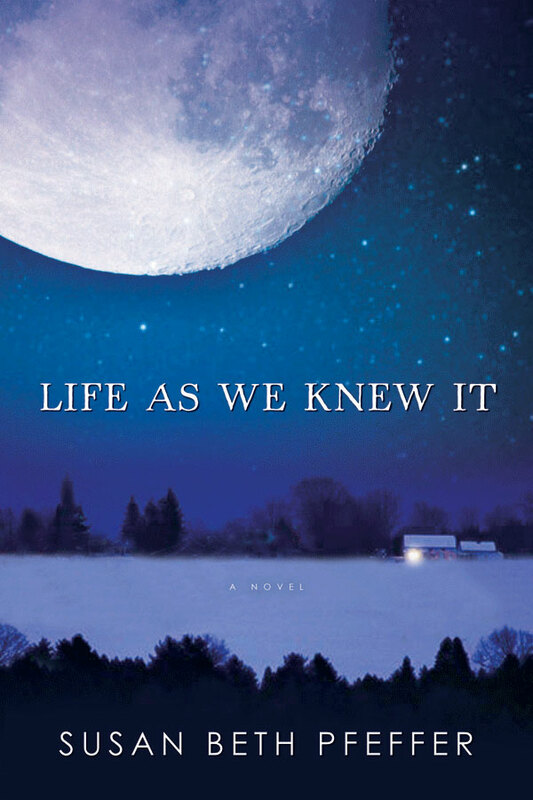 The critically acclaimed Life as We Knew It is a refreshing and frightening look at how a dystopia arises out of an environmental apocalypse. How should a family prepare for the future when worldwide tsunamis wipe out the coasts, earthquakes rock the continents, and volcanic ash blocks out the sun? As summer turns to Arctic winter, Miranda, her two brothers, and their mother retreat to the unexpected safe haven of their sunroom, where they subsist on stockpiled food and limited water in the warmth of a wood-burning stove. The only antagonist in this story is nature and the ever broadcasting President of the United States who sends out false hope and information and seems to be surviving just fine. The family’s reliance on technology is hard to give up as the electricity, gas and manufacturing of food all stops at once. Miranda documents through journal entries how she and her family come to grips with this new way of living, and going from worrying about a prom date to worrying about her next meal. Miranda sees friends turn to extreme faith, get sold to older adults, and die of plague or starvation. While the book touts environmental messages and critiques today’s society for their technology-based lifestyle, this is ultimately a story about learning to survive with what you’ve got, and never taking what you have for granted. Why you might like it: Really interesting look at how life might be like after environmental collapse. Shusterman, Neal. Unwind. New York:Simon and Shuster, 2007. Print. 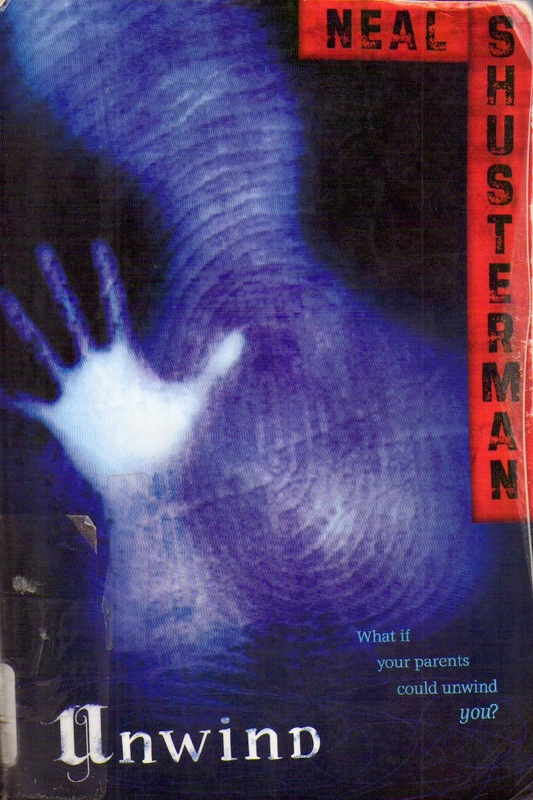 Neil Shusterman’s Unwind (2007) is a true dystopia, it is frightening, it is close, and in many ways it echoes Huxley’s Brave New World . In classic YA literature fashion this dystopia, more than any other, pits youth against the adult world. The resolution to the second American civil war, which was fought over the reproductive rights, has passed the Unwind bill. When a child reaches the age of 13, their parents or guardians may have them unwound using a new technology that can dismantle a body while keeping their consciousness intact, their body parts being used as a kind of organ donation (rather than mending a broken limb or nurturing an infection, transplants from’ unwinds’ are used). Set in the near future, the novel follows three teens about to be unwound, Connor, Risa and Lev. Connor is the main protagonist, he has always been trouble with a quick temper and an apathetic attitude towards academics. When, within the first pages he discovers his parents are going to have him unwound he runs away and encounters Risa, a runaway from an orphanage (basically an unwind farm) and Lev, a willing tithe, sacrificed by his religious parents for a ‘greater good’. Connor and Risa have one goal, to survive until their eighteenth birthday when the law will protect them from being unwound, while Lev wants nothing more that to fulfill his purpose. It is such a dynamic group, they make their way through the states uncovering the ways this seemingly contemporary reality is slightly atilt until they find themselves in an old airfield with a fleet of other unwind runaways. In a blatant connection to the actual unwind process, they find themselves stripping broken airplanes for parts to sell for their own survival. This barren and blisteringly unforgiving landscape and work draws a blunt comparison to the children’s own bodies. It’s just wonderfully poetic and I won’t give any more away. This text is just a hint that things will get worse for humans at humanity’s own hands before the environment will ever have its chance to wreck havoc. Why you might not like it: Would any parent really unwind their child? If you don’t believe me, or the back cover of the book, I challenge you to give it a read and see what you think afterwards. Unless you don’t like being terrified for these youth who are truly powerless in this new U.S.
Wyndham, John. The Chrysalids. London: M. Joseph, 1955. Print. The Chrysalids is set in the distant future after a global nuclear war. David, the young hero of the novel, lives in a tight-knit community, called WakNuk, of religious and genetic fundamentalists, who are constantly alert for any deviation from what they perceive as God’s creations. Deviations and Offenses are plants, animals and humans that are in any way unusual, and these are publicly burned or, in the case of most humans, banished. When banished, community members live in the wild country where, as the authorities say, nothing is reliable and the devil does his work. David at first does not question this fundamentalist indoctrination, but soon realizes that he too is out of the ordinary as he has a telepathic power. Saving himself, his sister and a group of friends, David flees. 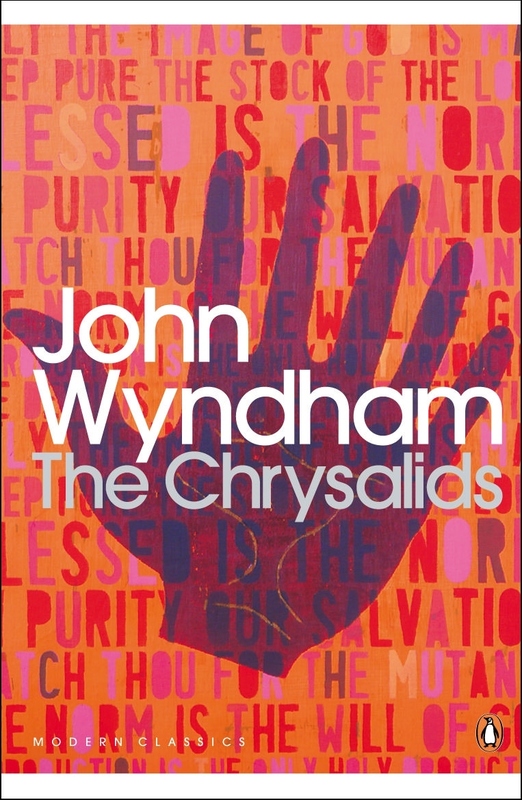 The Chrysalids is a wonderfully creative and well-constructed work from the classic era of science fiction. It is void of most technology, and what remains is limited and barely understood. The worries about life after the Cold War resonate throughout the text, and while it does have an ecological undertone, the environment is just as much affected and mutated as the humans. The book is more of a criticism of maintaining disparate uncommunicative societies that ends on an ambiguous note, for while the team of telepathic youth have made it to a place where they belong, it is clear that there is discrimination on the island against those who cannot communicate telepathically. This leaves the reader with the feeling that wherever they end up there is both good and bad, and that a complete utopia is an impossible goal. Why you might like it: One of the first sci-fi dystopias that young adults were really drawn to. It’s a classic. Post-nuclear-apocalypse science fiction adventure – what is not to like? Why you might not like it: Uhm…it’s a little older? Another one that school might have ruined for you? It’s such a short and fast read. Just do it.